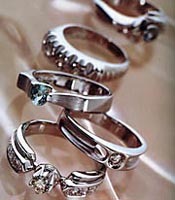 The number of jeweller firms in Saint-Petersburg increases. "Domestic jewellers face the future with optimism ". The adviser of Russian department of auction house "Christie" (New York) Valentine Skurlov has informed about it. The reason of it - the increasing number of jeweller firms in St.-Petersburg: if in 1991 there were only such 30 firms, today- about 80 firms were totaled. Besides to revive the jeweller industry in Russia Charles Faberzhe's traditions will help. Valentine Skurlov has noted some factors of " Faberzhe’s phenomenon ": the high quality staff, optimum working conditions and worthy payment. Business news archive for 26 July' 2002.